A dizzying succession of sheer cliffs lines a steep gorge carved out of the mountains by the Iya River. 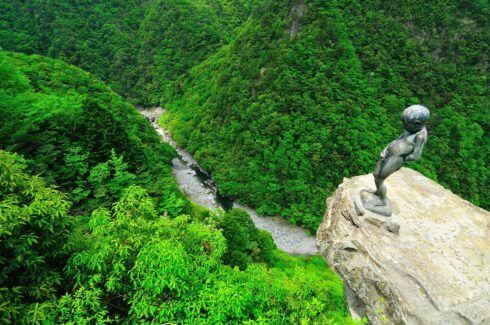 As a symbol of innocent courage, a statue of a peeing boy stands at the edge of a 200m precipice that is also noted for the seven curves along its rim. Take the Shikoku Kotsu Bus "Kazurabashi-iki (for Kazurabashi" at JR Oboke Sta. (approx. 55 mins). Get off at the bus stop "Iya Onsen-mae" then walk for 2 minutes.